(CNN) -- Arturo Gatti, who was found dead in a Brazilian hotel room in suspicious circumstances, is revered by boxing fans for his trilogy of thrilling and brutal fights with Micky "Irish" Ward. Arturo Gatti fought to the limit of his endurance in many epic bouts. The Italian-born Canadian captured world titles at super featherweight and junior welterweight during his 16-year-professional career and also fought and lost to legends Oscar De La Hoya and Floyd Mayweather Jr. in big money matches. But his 2002 and 2003 bouts with Ward will always be remembered, and two of them won the "Fight of the Year" award given out by the prestigious Ring Magazine. The first two fights were over 10 rounds, with Gatti losing the first and gaining revenge in a classic second bout. The third and deciding fight took place in June 2003, and Gatti broke his right hand in the fourth round. Almost unbelievably, he fought on and despite being floored in the sixth dominated the rest of the fight to win on a unanimous decision. Despite Gatti's winning the WBC junior welterweight crown the following year by beating Gianluca Branco of Italy to the vacant title, his storied wins over Ward proved to be the high point of Gatti's career. He made two successful defenses of the title against lightly-regarded opponents until running into Mayweather in June 2005. It proved a big fight too many, as he was slowed by body shots and cut a sorry figure as he was stopped in the sixth round. 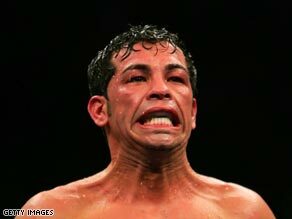 Moving up to welterweight, Gatti won a warm-up fight before losing to Carlos Baldomir in a world title bout. His comeback fight, with old rival Micky Ward by then his trainer, also ended in defeat to Alfonso Gomez in July 2007, and he promptly announced his retirement. It ended a 49-fight career with 31 knockout and nine defeats. His first world title had come with victory over Tracy Harris Patterson, the adopted son of heavyweight great Floyd Patterson, to claim the IBF super featherweight crown. As his fame spread and with countless nominations for Ring's Fight of the Year, Gatti, nicknamed "Thunder," gained a large and devoted following among boxing fans. But his life outside the ring proved contentious and in March this year the Canadian Press reported that Gatti was charged with assaulting his then girlfriend Amanda Rodriguez and spent two nights in jail after failing to turn up for a court appearance. Gatti later married Rodriguez, and they have a one-year-old son. She has been arrested in connection with his death.